World’s oldest public toilet, created at the dawn of the dinosaurs, has been unearthed in Argentina. Thousands of fossilized poos left by rhino-like megaherbivores were found clustered together, scientists say. The 240-million-year-old site is the “world’s oldest public toilet” and the first evidence that ancient reptiles shared collective dumping grounds. The dung contains clues to prehistoric diet, disease and vegetation says a study in Scientific Reports. Elephants, antelopes and horses are among modern animals who defecate in socially agreed hotspots – to mark territory and reduce the spread of parasites. However, their best efforts are dwarfed by the enormous scale of this latrine – which breaks the previous record “oldest toilet” by 220 million years. 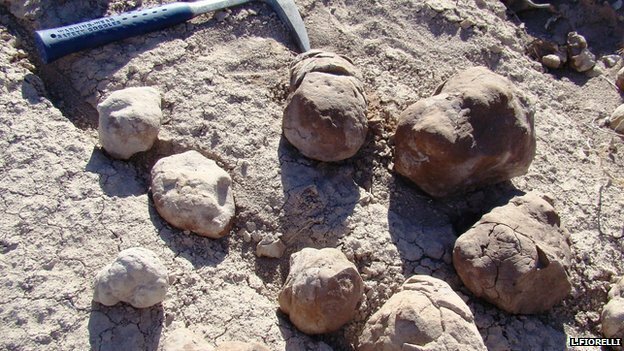 Fossil “coprolites” as wide as 40 cm and weighing several kilograms were found in seven massive patches across the Chanares Formation in La Rioja province. Some were sausage-like, others pristine ovals, in colours ranging from whitish grey to dark brown-violet. “There is no doubt who the culprit was,” said Dr. Lucas Fiorelli, of Crilar-Conicet, who discovered the dung heaps. The perpetrator was Dinodontosaurus, an eight-foot-long megaherbivore similar to modern rhinos. These animals were dicynodonts – large, mammal-like reptiles common in the Triassic period when the first dinosaurs began to emerge. The fact they shared latrines suggests they were gregarious, herd animals, who had good reasons to poo strategically, said Dr. Lucas Fiorelli. The predator in this case was the formidable Luperosuchus, a crocodile-like carnivore up to 8 m in length. But the dung patches were equally intimidating. A density of 94 poos per square metre was recorded by the researchers. And the excrement was spread across patches 900 square metres in size. Prehistoric coprolites are nothing new, but it is extremely rare to find an accumulation as old and substantial as this one – because faeces degrade so easily. A sheet of volcanic ash has preserved the ancient dung piles “like Pompeii”, said Dr. Lucas Fiorelli. The coprolites are like time capsules. “When cracked open they reveal fragments of extinct plants, fungi, and gut parasites,” said Martin Hechenleitner, a fellow author on the study.